First you'll need to press the leaves by putting them in kitchen roll and flattening them between a book. This should take around 3 days and will make it 100 times easier to apply them to the jar. You will also need to soak off the jar label with hot sopey water. After you've done this use a paintbrush to apply the PVA glue (you could use mod podge if you're in America, although I don't quite know what it does) to one leaf and place it on your jar. 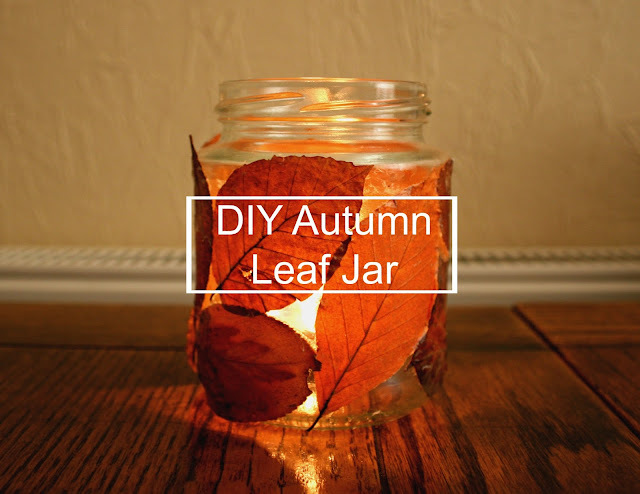 It may start to slide around a bit, so if it does take an elastic band and wrap it around the jar to hold the leaf in place. One the glue has dried remove the elastic band and repeat until the whole jar is covered and all the glue has dried. To finish off the jar you could put some straw around the rim (I didn't have any to hand) and then light a candle and drop it into the jar, so that the leaves glow. And that's it! I hope you guys liked this post, and if you want to see more DIY posts, please let me know, because this was so much fun to make! I'm also currently in the middle of creating a new blog, which is going to be the same but with a domain name and a new (more professional) theme. 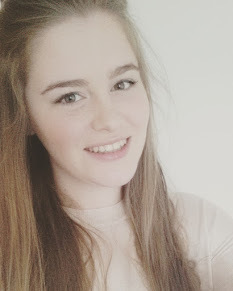 It should be up in the new year, I'm soooo excited!! Ooh this is such a lovely idea. I think it would make a nice addition to any gift, especially with straw around the top- maybe in a bow! Great idea! Thank you, you definately should as it was so much fun! This looks so pretty, it would make a lovely centrepiece for an Autumnal party! It's look simple but very pretty and useful.